The purpose of Just-In-Time is to allow you to debug an application who recently crashed while Visual Studio IDE was not launched and configured to debug that particular application. 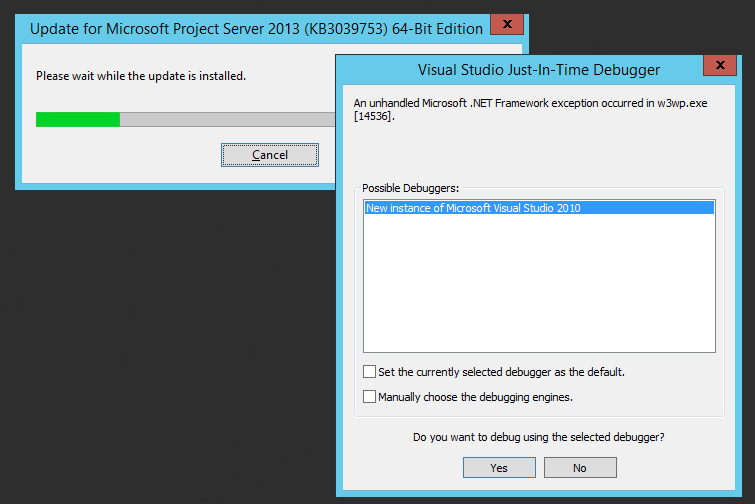 Much shorter, Just-In-Time is a cool functionality for the developers, but as sysadmin you usually don’t expect and need to deal with Visual Studio Just-In-Time Debugger popup window on production servers. However there are situations when for example a simple SQL Server Management Studio installation on the production server will enable it. As you can see in the bellow screenshot, I recently encountered it when I manually installed the ​May 2015 CU for Project Server 2013. I didn’t got the DisableJITDebuger.reg with me at that moment and started browse some articles to find out how. Now I post it here and will be more handy next time (as long as I have internet connectivity 🙂 ). The bad part with Visual Studio Just-In-Time Debugger is that in some scenarios it can increase your server maintenance time. For example you are manually installing a patch who can get stuck to a phase where … let’s say it requires to communicate with a particular .NET application. If that .NET application crashed and the Visual Studio Just-In-Time Debugger triggered, than your patch installation will probably wait that .NET application to “do something”, but that .NET application is waiting to be debugged. It depends a lot on how well the patch installer is behaving in such situations (either silently continue, or is waiting – case in which no progress will be done until the sysadmin clicks the “No” button of the Visual Studio Just-In-Time Debugger window). I personally got the situation where I started in parallel the same patch installation and on one server the installation finished, while the other was still in “progress” waiting me with the Just-In-Time Debugger popup window. The good part is the Visual Studio Just-In-Time Debugger can be disabled and I encourage to do it on the production servers (unless for a well-defined reason debugging is required there). "DbgManagedDebugger"="\"C:\\Windows\\system32\\vsjitdebugger.exe\" PID %d APPDOM %d EXTEXT \"%s\" EVTHDL %d"
"Debugger"="\"C:\\Windows\\system32\\vsjitdebugger.exe\" -p %ld -e %ld"
within are about 6-8 files. You can either move the VS7 folder to another location on your computer or just delete it. then close the just-in-time window.